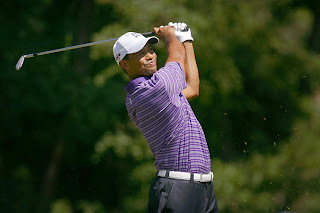 The Golf Coast: Tiger Woods making a charge? Check out the leaderboard when play begins Saturday in the PGA Tour's Farmer Insurance Open. Tiger Woods is tied for 12th halfway through the $5.8 million pursed tournament at Torrey Pines Golf Course. Woods carded his second straight 69 to place himself five shots behind leader Bill Haas. El Tigre was in bad shape before two late birdies got him to 6-under par for the tournament. So is Tiger Woods back? Or is his game still light years away? Woods is flashing the potential that made him golf's most dominant force since Jack Nicklaus. But his game hasn't returned, either. Woods had a bogey stretch that was unheard of during his scorching run prior to the marital scandal that's left him No. 3 in the latest Official World Golf Rankings. A victory at Torrey Pines, however, will do more to steer Woods back to the mountain top.